This video was in collaboration with Odigo Japan on the Kim Dao Youtube Channel. Japanese festivals are very popular in the summer time in Japan. 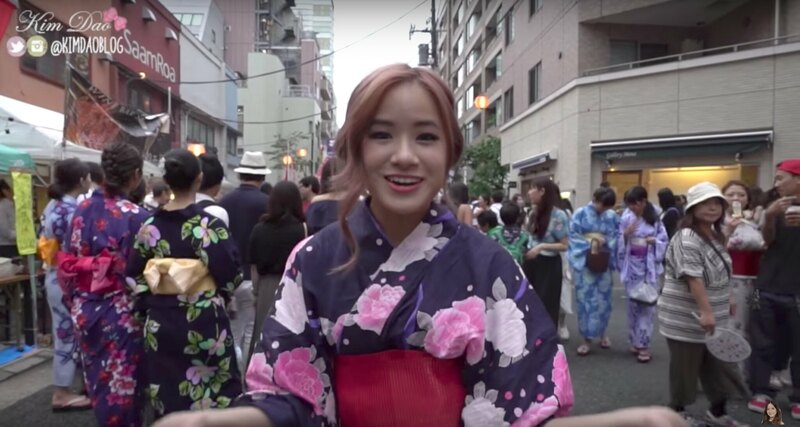 This video was shot in a “Get Ready With Me” style as I got ready for the Japanese festival in Azabu Juuban. Girls usually dress up in the traditional Japanese Yukata in the summer time. I was lucky enough to own one which was previously gifted to me. Even though a Japanese festival is a great excuse to be able to wear a Yukata, if you don’t own one you don’t have to turn up in one! For those who are wanting to buy a Japanese Yukata, in the summer time may stores sell them, most Don Quijote (they are usually in big neighbourhoods) sell Yukatas for decent prices. It is a bit of a challenge to put one on yourself, however there are Youtube videos showing you how to do it step by step. At the Japanese festival, I walk around and show what you are able to do there. It is free to attend the festival and the roads are all closed off for the public. Typically at a Japanese festival, there are a lot of stores selling a wide variety of street food. Im this video, I try out a variety of different foods from different countries. There is also a lot of entertainment as well as games at a Japanese summer festival. Some festivals even have fireworks that you will be able to enjoy. Festivals are typically held around July-August every year so if you are in Japan during that time. Definitely research to see if you’ll be able to catch any of the summer festivals!